Home / ATM Cards / Credit Cards / Infolinks / Instructions about ATM Cards / Master Debit Cards / MasterCard / Payoneer / How to use Payoneer Debit Card at ATM Machines in Pakistan? How to use Payoneer Debit Card at ATM Machines in Pakistan? You can easily withdraw cash from your Payoneer Debit card at any ATM machine. This card works just like any other ATM or Debit Card. I am using Payoneer Card from last 04 years for online shopping and payments. I got this card through Infolinks. You can also get your own Free Payoneer Prepaid Debit Card with 25$ bonus at the time of first money load. Until few days ago, I was using this card for online shopping only and never withdraw money at ATM Machine. Last week I decided to get cash from my Payoneer account by using ATM Machine to experience process, currency conversion rate and fees applied by either Payoneer or Master Card or local bank. I went to a MCB ATM Machine and successfully withdrawn money without any hassle. 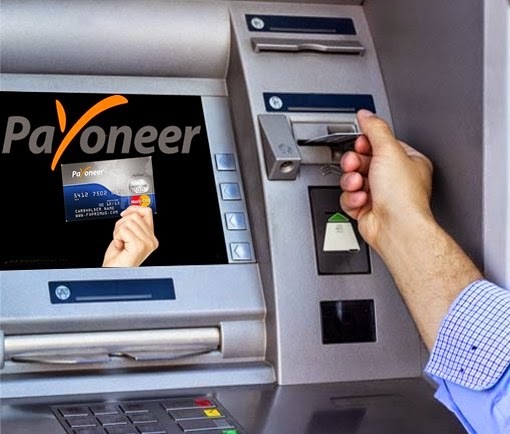 How to Withdraw Money from Payoneer Card at ATM Machine? The Payoneer card can be used at ATMs where MasterCard®/Visa is accepted. Your Payoneer card is prepaid debit card. Sufficient funds must be available prior to making cash withdrawal. Never try to withdraw money more than available funds; otherwise your ATM card may be kept/ seized by ATM. Here is a simple step by step procedure to use your Payoneer Card to withdraw cash from ATM Machine in Pakistan. Visit any nearby ATM Machine. Insert your card in ATM card slot, your name will be shown on screen. Enter your 04 digit code using ATM keypad, this code was created at the time of card activation. Enter amount in Pak Rupees in multiples of Rs.500 e.g. 500, 1000, 2000, 2500, 4500, 5000, 6500 etc. and press "Accept" button. In next step you will be asked for "Account Type", enter Current, Checking, Default or Debit Card whichever is available. Take your card, money and receipt. Never check your balance unnecessarily at ATMs because each time you check balance, 0.90$ will be deducted. $0.90 will also be applied as ATM decline fee, if your Payoneer account has less money than you are trying to withdraw. $2.15 per transaction, plus 3% above all fees assessed by MasterCard, will be charged. MCB Bank also charges Rs. 100 as Bank Fee in addition to all other fees. I withdran Rs. 4500 and amount deducted from my Payoneer account was $50.87 when inter bank dollar rate was about 99.5 rupees. So total fees/ charges was about Rs. 500. Can you please tell me which banks supports payoneer in Pakistan and their limits? iss website per jao payoneer.com or sign up kar ke requested information enter karo 25 days mein card aap ke address per mill jay ga. But I have heard that MCB, SCB, Faisal Bank etc. working smoothly with Payoneer Card. Should I want to withdraw ??? @Afzal You can use it for shopping. maximum kitna withdraw kr skta hai payoneer master card se ATM machine main se??????? Yes you can withdraw money from MCB, even you have not account in this bank. islamabad main MCB ki kis branch py ch rha hy payoneer card? You need a Credit Card to add funds. UBL WIZ Debt Card also work well, I have personally added funds via UBL WIZ Card. Toady i have recieved my payoneer mastercard. You may contact with Payoneer Customer Support. Salam please guide me # 923360109680 100 euros pey kitna changes hain and agar kisi country set paisy mangwany ho to WO whahan sey kiasy bhejy ga kya tarika kar hoga please contact me. To receive money from anyone, anywhere in the world; Login to your Payoneer account, Click on Receive button and then Request a Payment. A form will open where you will be asked to enter detail of the sender. Once you submit the form, the sender will receive a link in the email. Then he can send you money by using any credit card. Please refer to the Fee section for Charges related queries. It only works in standard chartered or MCB. Hi Waheed. i hear bank alflah dont have atm withdrawal fee. Is it true? because i use STC and they deduct 300 for each transaction. Can you please let me know when you withdrawal your last payment and which bank? I had got a PayPal through my Payoneer card years ago. And withdraw money through ATM machines. Is it cost effective to now transfer from payoneer card to your local bank account or no? when me jab payoneer master card add karna chahun freelancer.com account s aur freelancer.com mujh sa card no mangainga to mne uhian payoneer card ka last 4 digits dun ya payoneer master k pin code ka 4 digits dun? Sir payoner mastercard main minimum amount Kitni load krwa saktay hain? Guys i have payoneer but they didnt ask me for pin code. Meny abhi tak koi transaction nhi ki. Ye pin code kab enter krna hota h and kb rkhty hen? Can any one suggest? Payonner card main minimum Kitna load krwa saktay hain? Mere pas payoneer k 2 card hn but mujy ye nai pata ky us me paise kamate kese hn. Plz ap log online jo job karte ho batao. Koi online job batao payoneer me paise kamane ki. Mujy kisi job ka nai pata. Cheema bhai go to upwork.com and make your account there and start applying for jobs. i have 137$ in my payoneer account, when i went to MCB ATM, it said there is 0.00 balance. and my payoneer account still having 137$, can you guys plz guide me how i can get my payment? You should contact with Payoneer Support. I guess ATM balance inquiry is not accessible for Payoneer. For withdraw , which Bank atm charge the least tax ? I heard that Alflah Bank atm doesnt charge, is that true? Use a any other credit card either of yourself or any of your relative or friend. There are no govt. taxes but there are fee by Payoneer and Bank charges for using ATM.